You are Welcomed to the Official Website of Bibi Balwinder Kaur Khehra Dhadi Jatha. Here You'll find almost all information about Bibi Balwinder Kaur Khehra Dhadi Jatha. You can find links to their Official Profiles and Downloads. 'Bibi Balwinder Kaur Khehra Dhadi Jatha' is a group (Dhadi Jatha) of four members. 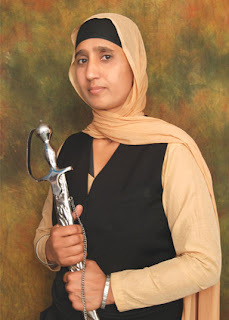 Bibi Balwinder Kaur Khehra is the Head of the Group. She is a Lecturer and do speeches about Sikhism, Sikh History and Gurbani. Two are Dhad operators(Also known as Dhadi, Who sings Dhadi Wars) and one is Sarangi Master. They Do live programs on different-different occasions. You can listen to them by following Official links below and can also call them via contact details given below.